Since the 80’s, Metal always have some trends that come from out of nowhere (and get back to nowhere, fortunately). In the 80s, Thrash Metal was the focus (leaving Death and Black Metal in the depths of underground, seeming like dead styles), the 90s was the decade of Death and Black Metal (in underground scene) and the rise of Industrial Metal and melodic Power Metal, and in nowadays, some bands try to rescue the “rooty” Thrash Metal from the 80s, the more underground and harsh form of it, some getting good results, some that really don’t deserve mention (we’re telling about the carbon copies that infest the scene), and some who are in the middle, that have nothing new to say, but have some potential to do something good if the musicians open their eyes. 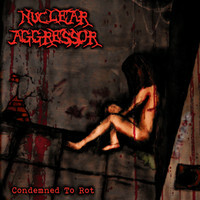 And the Italian trio NUCLEAR AGGRESSOR is one more that have talent, showed in their first Full-Length, “Condemned to Rot”, but wasted its time trying to be another bands. They really try to do something good, but the shadow of their influences is too evident: KREATOR and early German Thrash Metal. Good guitar riffs, drums and bass demonstrated a fair work, but the vocals are a weak point, and need more power, as well as they need urgently to left the “80s complex” behind and try to do something that reflects their own personality. And to make the things poor: the recordings’ lack of weight (the guitars are sounding like they were record in a little and old one-track radio). You can have some good results without having a good recording, but it’s not the case here. The sound production takes the band’s music to an 80s Demo level, being too harsh and dry, needing more weight, as the guitar needs a more heavy sound. The core of Thrash Metal is the guitar riffs, so, it’s not a facultative thing, but a demand. And the dry vocals really disturb us all, trying to sound like a poor version of Mille Petrozza. But it’s not a total loss, for we can see a vigorous try in songs like the fast “Inexorable Fate” and the more mid tempo “The Grave Awaits”, but the lack of a self-personality is something that we can’t leave aside. The sensation that they’re making something forced, trying to sound like their idols, is too clear. The only thing that’s left to say: guys, you have potential and talent, so leave aside what’s in the past, do not try to revive something that’s dead. Try to look inside of you, and put it out. You’re can be more that we hear in this work.